Carbon Flex Vitalize Spray Sealant uses coating technology to enhance durable protection on any vehicle. The advanced spray sealant protects against UV solar rays, contamination, discoloration, water spots, and much more. Carbon Flex Vitalize Spray Sealant boosts the gloss and protection characteristics of Carbon Flex Protective Coating and other ceramic or carbon based coatings. Vitalize Spray Sealant restores the incredible water beading and sheeting effects of Carbon Flex and other protective coatings. Carbon Flex Vitalize Spray Sealant uses synthetic protection to create a durable shield with stunning shine and gloss. The versatile spray sealant can be applied when the surface is wet or dry. Carbon Flex Vitalize Spray Sealant also removes fingerprints, dust, and light dirt to restore a brilliant shine. The innovative coating detailer extends the life of Carbon Flex coating on paintwork and trim. Simply apply after a wash to extend protection in all climates and weather conditions. Carbon Flex Vitalize Spray Sealant creates a hydrophobic shield that repels water and contamination. 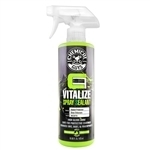 Vitalize Spray Sealant helps repel dirt, dust, and contamination from exterior surfaces. Carbon Flex Vitalize Spray Sealant enhances gloss, extends durability, and cleanses the paintwork of dirt and dust. Once Carbon Flex Vitalize Spray Sealant is applied, washing your car is faster and easier. Enhance and protect any vehicle with Carbon Flex Vitalize Spray Sealant. Carbon Flex Vitalize Spray Sealant is specifically designed to maintain and enhance protective coatings. The innovative spray sealant uses coating technology to protect vehicles in all weather conditions. Carbon Flex Vitalize Spray Sealant is designed to work with Carbon Flex Protective Coating. Road conditions can cause dirt, debris, and contamination to stain and degrade your vehicle’s protective coating. Using a generic detail spray on any protective coating can push dirt and contamination particles into the coating surface, accelerating the degradation process. Carbon Flex Vitalize Spray Sealant is engineered to safely remove dirt, dust, pollution, contamination, fingerprints, and water spots before they can damage the protective coating. Simply mist Vitalize Spray Sealant on top of Carbon Flex Protective Coating to ensure the maximum level of vehicle protection. Vitalize Spray Sealant strengthens Carbon Flex Protective Coating to help it last a full 36 months. Carbon Flex Vitalize Spray Sealant works with other coatings, such as Second Skin 6 Advanced Hybrid Protective Coating. The versatile formula also works with traditional sealants and carnauba wax. Carbon Flex Vitalize Spray Sealant is the ultimate detailing spray to enhance and maintain any coating, sealant, or wax protection coat. Protecting your vehicle using Carbon Flex Protective Coating ensures your vehicle is protected for years of daily driving. To ensure your protective coating provides maximum protection, it is important that you maintain the coating surface for the best appearance and performance. Carbon Flex Vitalize Spray Sealant is formulated to maintain the brilliant shine of your vehicle’s Carbon Flex protective coating layer. Generic detail sprays and cleaners can prematurely wear down protective coating characteristics. Carbon Flex Vitalize Spray Sealant conditions your vehicle’s protective coating by safely and effectively removing light dirt, dust, and contamination, and adding protection polymers back into the coating. The spray sealant formula utilizes coating technology to enhance the protective characteristics of coating systems that are installed on the vehicle. Using the Vitalize Spray Sealant improves the sheeting and beading on the coating surface. Easily remove dirt and dust from plastic, rubber, and vinyl trim protected using Carbon Flex Trim Coating. Keep your vehicle’s protective coating in superior condition with Carbon Flex Vitalize Spray Sealant. Carbon Flex Vitalize Spray Sealant is the perfect spray sealant to apply after a weekly wash. Cars that are protected using Carbon Flex Protective Coating are able to be washed and dried faster than ever imagined. Carbon Flex Vitalize Spray Sealant takes washing and drying your car to the next level. Using Vitalize Spray Sealant on a regular basis will strengthen and enhance the performance of any protective coating system. Your car will wash easier and dry faster. Simply spread Carbon Flex Vitalize Spray Sealant after a weekly wash with a premium microfiber towel. The Vitalize Spray Sealant is designed to instantly bond to the protective coating and strengthen the coating structure. Carbon Flex Vitalize Spray Sealant adds a high gloss shine to any color paintwork for the highest quality results after each application. Bring new life back to protective coatings with a single application of Carbon Flex Vitalize Spray Sealant. Carbon Flex Vitalize Spray Sealant is also available in 4 ounce, 64 ounce and 1 Gallon sizes. Note: Chemical Guys makes no claims on the durability, longevity, or efficacy of competitors' vehicle coating products. Carbon Flex Vitalize Spray Sealant will not strip old coats of wax, sealant, or protective vehicle coatings. For best results, spray Carbon Flex Vitalize Spray Sealant then use a clean microfiber cloth to gently wipe the area clean. For best results, apply Carbon Flex Vitalize Spray Sealant after every wash to ensure a perfect finish with long lasting protection. Use Carbon Flex Vitalize Spray Sealant between washes to remove dust, bird droppings, fingerprints, and water spots while providing extended protection. Always use a clean microfiber cloth to minimize the risk of scratching.